Share This Post: PPC & SEO: Friends or Foes? There is a long running debate between digital marketing specialists about “which is better”, PPC or SEO. You can find countless articles on the subject comparing and contrasting the two, weighing their advantages and disadvantages side by side. SEO specialists will tell you that although seeing results takes time, the results are higher quality leads, where PPC buffs argue that you can generate more results in a much shorter amount of time. It’s high time we reconsider this debate. Instead of looking at SEO and PPC working as isolated strategies to increase traffic, and therefore conversions, we need to consider what value they bring when you, as a digital marketer or business owner, are optimizing both. The truth is, your results will be far more astounding. The reasoning behind this is unclear – it’s usually assumed that a potential buyer will click on an organic listing over a paid ad if there’s the option. One likely reason is brand reinforcement, and that a user who is looking to buy will trust your brand more if they see both an ad as well as organic listing. These statistics alone are a good reason to utilize both PPC and SEO. But how can your own, specific PPC campaigns and SEO strategy help one another, and what can you do to take advantage of this? PPC experts may be right about one thing, and that’s getting keyword data and seeing tangible results quickly after AdWords setup. In fact, many will suggest that before you do any SEO strategy, you should set up your ad campaigns first. In doing this, you will see the exact keywords down to the phrasing that people who are entering your site are using. With this information, you can determine which keywords have a high conversion rate, and incorporate them into your SEO strategy. 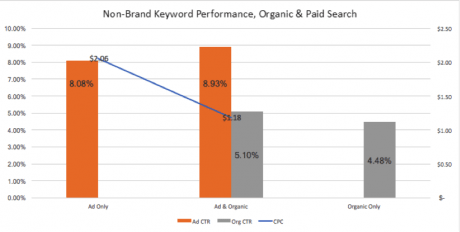 Another benefit of PPC ads is analyzing which ads do better, and consider what wording they use. By doing this you can use some of you better performing PPC ad copy to inform your organic content – primarily for things like title tags and meta descriptions. Organically testing different attributes to find what works best can take quite a while, where you’ll quickly know what does or does not work by looking at your PPC ads. When you enable site search on your website’s analytics, you are able to see exactly what questions your users have about your products when they are on your site. This is especially useful for creating PPC ads. Where title tags and meta descriptions usually need to encompass as much as they can (without being vague), you can have as many PPC ads as you want, and you can be as specific as you want. So if you find that people are searching on your site for a very specific quality of a certain product you have, you can incorporate that into your ads. Very little comes from arguing over which strategy works better than the other, when combining them accomplishes so much more. PPC and SEO can help to inform one another about your particular audience, and if you use insights from one and apply it to the other, you will find both your organic and paid listings begin to rise – not to mention higher CTRs and lowered CPCs. Two heads are better than one, right?